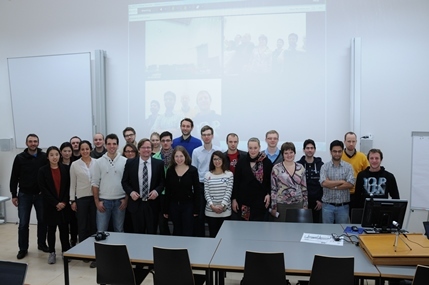 3rd ERCIS Virtual Seminar, which took place during Winter Term 2013/2014, was very special, as this time participating virtual teams besides writing a scientific paper also took part in the 2014 Hilti IT Innovation Competition. Hilti is a global leader of value-added, top-quality products for professional customers in the construction and building maintenance industries (www.hilti.com). The goal of the Competition was to envision, how the future communication and collaboration between Hilti and its customers, as well as within Hilti, might look like. This year not only ERCIS Partner Institutions, but also external universities could take part in the Seminar, which has led to a record number of participants - 60 students from 7 universities. The participating universities included the University of Muenster, the University of Liechtenstein, the University of Twente, the Ulsan National Institute of Science and Technology, the University of Tartu, the University of Minho, and the Athens University of Economics and Business. The students were divided into 15 groups (four students per group) and, as usual, had to set means of virtual collaboration with each other in order to then jointly work on an announced topic. The first task was to design an innovative approach for B2C interaction in form of a (web-based) prototype, a movie or a concept. All developed innovative ideas were sent to Hilti directly and then presented during the mid-term presentation. The second task was to write a scientific paper based on the developed solution and present it during the final presentation in Liechtenstein. At the end of the Seminar all participants received Certificates of Participation. Five of the 15 teams were shortlisted and invited to a 2½-day workshop at Hilti headquarters in Liechtenstein, where one of the Seminar teams took the 2nd place and won Hilti power tools! This is an amazing result taking into account that 55 teams world-wide took part in the Competition and only 10 of them were selected as finalists! Another great achievement is recognition of the ERCIS Virtual Seminar on a global level with the AIS Award for Innovation in Teaching conferred to Prof. Dr. Jan vom Brocke. 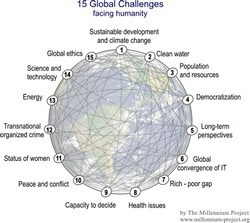 2011: How can IS Contribute to Global Challenges? In October 2011 the first joint ERCIS Virtual Seminar was launched, which dealt with the topic "How can IS contribute to Global Challenges?" Thirty-one students from 7 countries participated in this Seminar and worked in international teams on specific topics, e.g. how IS can contribute to provision of clean water to everyone or bringing into balance population growth and resources. Each group of students was provided with one global challenge e.g. energy, global warming, or peace (see http://www.millennium-project.org/ for further information) and had to write a research paper on how IS can contribute to overcoming this challenge. Participating ERCIS members came from Liechtenstein, Italy, United Kingdom, Russia, Switzerland, Netherlands, and Germany. In October 2012 the second joint ERCIS Virtual Seminar was launched, dealing with the question "What will Digital Society look like in 2020 in terms of Entertainment, Living, Gaming, Transportation, Education, Participation, Culture, Health, Dating, Science, Tourism, and Retail?" 28 students from the University of Liechtenstein, the University of Münster, and the University of Twente participated. The task for the second Virtual Seminar was to write a scientific paper in an entirely virtual team. Each group of students was provided with one topic, e.g. Child Care, and had to write a research paper on what would child care look like in 2020 and how Information Technology would influence this area. The intention of the Seminar was, again, to teach soft aspects like internationalization, virtualization, and collaboration within the BPM / IS education in order to better prepare the students for their future work. Each group consisted of students from at least two different universities. Each Seminar was accompanied by at least one supervisor per institution who was responsible for weekly local meetings with students. Furthermore, each supervisor was responsible for one or more topics and served as a contact person for a respective group. The students learned how to organize themselves and collaborate in virtual international teams. They gained experience in writing a scientific paper, as well as publishing and presenting the findings. They reflected on themselves, their group members and their work by continuously filling out a self-assessment blog (Agility Portfolios). During virtual kick-off meetings each group was asked to briefly present their first ideas (5 Minutes). During mid-term presentations, where all Seminar supervisors and participants were involved, the students had to report on their progress. Each presentation took about ten minutes followed by a short discussion. All virtual meetings were held via Adobe Connect or Google Hangouts. Agility Portfolios contained questions on e.g. expectations prior to each virtual meeting, as well as experiences and opinions after it. The blog, thus, acted as a basis for students’ individual lessons learned. Final presentations took place in Liechtenstein, i.e. they were not virtual, but face-to-face, so that students could finally meet the other team members in real life after months of virtual collaboration. All students were invited to come to Liechtenstein, but were not obliged to do it and could also present virtually. Each group had about 20-25 minutes time for presentation followed by 5-10 minutes of discussion, where the students could get a detailed feedback on their Seminar paper.